The major battle for all the parties in the Assembly campaign has proven to be apathy, as well as antipathy, towards the Stormont institutions. After making gains in this year’s Dáil elections, Sinn Féin president Gerry Adams said it was “of essential importance” that people came out and voted. With support low for both the Ulster Unionist Party and the nationalist SDLP, Sinn Fein’s Martin McGuinness and the DUP’s Peter Robinson appear certain to again share the office of First Minister and Deputy First Minister. The possibility that they could swap titles if Sinn Fein outpolls the DUP has features heavily in the campaigns, but has not sparked significant interest among either the nationalist and unionist communities. Televised political debates were largely ignored by the public, and a low turnout today could raising questions for the political process and the credibility of the Six-County institutions. Although key local elections are also taking place today, the public’s apathy towards the Assembly is based on the belief that it has few powers no capacity to bring about significant political change. Under the terms of the 1998 Good Friday Agreement, motions before the Assembly can only pass with the clear dual support of a majority of unionists as well as a majority of nationalists. 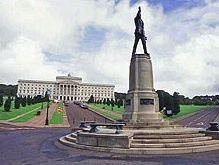 The restriction guarantees a unionist veto on political change and has resulted in almost complete deadlock on a number of controversial issues. Speaking from Fermanagh, where he was carrying out last-minute canvassing, Sinn Féin President Gerry Adams TD said that it was important that people used their vote. “May 5th marks the 30th anniversary of the death of Bobby Sands. The people of this constituency showed the power of their vote when over 30,000 of them came out and elected Bobby as their MP. It was a democratic action that shaped the course of history. “We have fought this campaign on the front foot with a positive message that change is happening and that further progress will be made in the course of the next four years. Sinn Féin are seeking votes right across the north. “In addition to the Assembly elections we are seeking to see Sinn Féin representatives elected to councils which have previously been the sole domain of the unionist parties. We are offering people a real choice. “Sinn Féin Ministers and MLAs have led from the front over the course of the last Assembly term. That team is now strengthened by 14 TDs and only last week 3 new Sinn Féin Senators. Elswhere, a team of canvassers from the socialist People Before Profit Alliance were attacked in the Waterside area of Derry. Assembly candidate Eamonn McCann and local council hopefuls Diane Greer and Davy McAuley were among those attacked on Monday by a loyalist mob, leaving one canvasser hospitalised. Davy McAuley, the Waterside Council candidate, says the campaigners were badly shaken by the assault. One of the canvassers later explained that they told their attackers that they were not republicans, but the violence continued nevertheless. Sinn Féin described the incident as deplorable but also criticised the PBP for their remark about not being republicans. “PBP needs to clarify their position, do they by their comments believe that if it had been republican canvassers that the attack would have been justified,” he said. Full results from the election counts will be published here as they come through on Friday and Saturday.